Click here to order this book. On the Scene in '19 is a creative group of debut picture book and middle grade authors publishing in 2019. I am honored to be the first author in the group to be interviewed about my upcoming children's book. Link to Interview about From A to Z with Energy! recommended for parents, daycare workers, classroom teachers, and home schoolers. 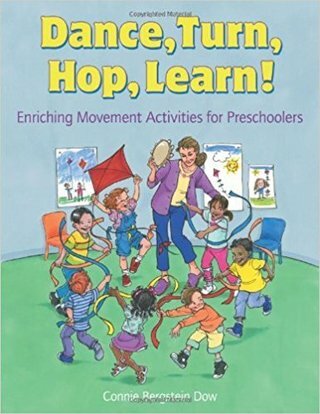 "A favorite resource for preschool musical activities"
The Early Childhood Music & Movement Association- a professional organization that supports the field of early childhood music and movement through education, advocacy, and networking- recommended Dance, Turn, Hop, Learn! as an important movement and music resource for teachers. My preschooler loves to move around and these activities help me give her focused ways to use her energy. She learns as the activities spark dialogue. Her little brother loves to join in, too. Heck, I have a ball doing them, too. Highly recommend. Very Good, Professional ,Original YAY!! Well written and easy to use. Illustrations related to txt are very useful Thank you. Having taught kindergarten for over 27 years I wondered if I needed to purchase this book. WOW! - Was I suprised! This book includes everything a teacher would need to know. It puts in writing the reasons for the activities, centering on the child. I look forward to using this book as a teaching tool in my classes. This book really provided some great ideas for the active play/gross motor part of my family day care program. From A to Z with Energy! IT'S HERE! Playful rhyming ABC book, with illustrations by Gareth Llewhellin. Will inspire children to get up and get moving! Collection of movement activities to enhance children’s physical, social and emotional, and cognitive learning, designed to bring playful movement to every part of a child's day. Thirty-eight playful creative movement lessons designed around early childhood themes like animals, seasons, colors, and shapes. Addresses early learning concepts, helps children build their large and fine motors skills, and supports emergent skill development.